"Rebuilt Green is the first book to explore the true meaning and social dimensions of green building." 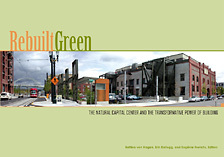 This is a book about a building: the Jean Vollum Natural Capital Center — one building among many in a rapidly changing neighborhood in northwest Portland, Oregon. 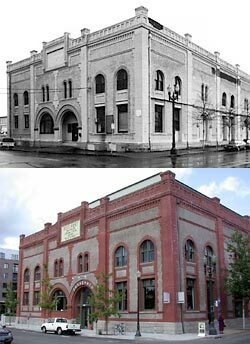 This building's story began over a century ago as an important river, rail, and then trucking distribution center. This was followed by a period of decline and virtual abandon, and then, in recent times, renewal. As the latest owners of the building, we at Ecotrust chose to redevelop this nineteenth century warehouse in a way that would respect the earliest chapters of its history, but would also embrace, and indeed push the bounds of twenty-first century technology and ideas. With an ambitious vision, we have added a few chapters to the building's story. Today it stands as a building of light, air, and water; a building that is highly adapted to its purpose and its place. In 1998 Ecotrust went looking for a building. We wanted an old building to help anchor us in the region's history — to take a building from the time of westward expansion (and a frontier economy) and redeploy it as a hub for the new conservation economy. We also wanted to be conveniently and centrally located to reduce transportation infrastructure and energy use, to curtail urban sprawl, to support the vitality of the city center, and to maximize the flow of people to the building so we could build a clientele for the conservation economy. Finally, we wanted a site that was big enough to house a diverse array of retailers, offices, for-profit, and non-profit organizations. By 2001, Ecotrust's team of developers, architects, designers, and green building experts had transformed our neglected, century-old warehouse into a state-of-the-art, 70,000 square foot home to a diverse array of retailers, businesses, and nonprofit organizations. Upon entering, visitors are invited to take a self-guided tour exploring every nook and cranny, learning how this historic structure was transformed into a marketplace for the conservation economy and a powerful example of green building. Building is a very powerful event. Many of its effects are apparent: buildings shape cities and towns, influence transportation patterns, create beauty or diminish it, and influence how residents move, live, and think about their potential and opportunities. Buildings also affect the landscape in ways less immediately apparent. Their construction and operation uses vast amounts of material, energy, and water. These effects can be seen in the surrounding landscape as buildings infringe upon wild lands, as dams limit stream passage to provide for increased energy needs, and as contaminated stormwater overwhelms and pollutes waterways. The shadow of buildings can also extend across the globe, to iron ore mines in the Venezuelan Amazon for steel, to old-growth forests in coastal British Columbia for framing lumber, to the Earth's atmosphere where greenhouse gases accumulate from fossil fuels used for heating and cooling. Ecotrust hoped that the Natural Capital Center would spark the imagination and creativity of those who work in and visit the building. What we did not fully anticipate was the degree to which we would become addicted to green building in the process. In addition to adding a significant element of fun and fascination to the project, we discovered that "going green" simply made good sense. It did not cost significantly more than conventional building techniques, and is making a world of difference in the building's ecological impact and the health and productivity of its occupants. It is our wish that the story of the Natural Capital Center's redevelopment and transformation will persuade others that the only way to build — and rebuild — is green. 10 x 7 inches, 120 pages, ISBN 0-9676364-2-6.